IIC hearing aids offer the ultimate in discretion, combined with natural sound quality. Wearing a hearing aid can make you very self-conscious. The embarrassment can be enough to make many wearers take their hearing aids out when in public, which is when they’re often needed most. It doesn’t have to be this way, though. There are many options when it comes to the style of hearing aids – IIC models offer the ultimate in discretion without sacrificing sound quality. 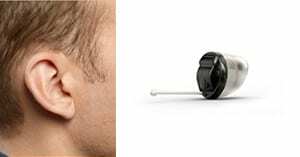 IIC hearing aids, or invisible in the canal models, fit deep within the ear canal, even more deeply than completely in the canal models. This ensures that they are invisible to everyone. They’re also suitable for those with mild, moderate or even severe hearing loss. The tiny base fits completely within the canal, while a minute antenna extends out to pick up sounds. This ensures that you enjoy natural sound quality along with the reduced visibility you want. Another benefit here is that many first time users find that adjusting IIC hearing aids is easier than with other styles, and that the occlusion effect is dramatically reduced. Finally, you’ll find that feedback is much less pronounced when using the phone. It’s easy to almost completely forget that you’re wearing them, offering you less self-consciousness when out in public, as well as the improved hearing that you deserve. If you’re considering IIC hearing aids, contact Pindrop today at 416-484-4327 to learn more about the various options on the market. Our professional audiologists will provide a full hearing analysis and help you determine which of the many hearing aid styles on the market is right for your needs and your budget.